Spring means a burst of colour in nature, but there’s been a burst of colour in the print and paper world lately, too. Australian paper merchants, BJ Ball, launched Colorplan this year, which has seriously brightened up the scene! We chatted with Tony Bertrand, the Marketing and Business Development Manager for the BJ Ball Group to chat to us about this new range of paper, Carte Blanche and the latest trends in print design. WATERMARX GRAPHICS: You had the first “Carte Blanche” this week. What is it and how did it go? TONY BERTRAND: Carte Blanche is a series of events held around Australia aimed at educating Designers about the amazing world of Paper and Print. We have already held 2 in Sydney and have Melbourne on the 11th November 2014. Last week we ran the event in conjunction with AGDA. 42 people registered and the feedback was amazing. Paper and print is cooler than ever, and designers want to know the latest innovations that can help them and their clients. 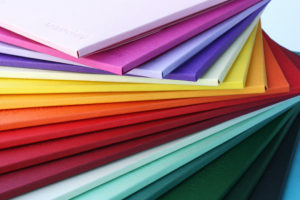 WG: Colorplan is your latest range of stock – what can you tell us about it? TB: 50 shades of colour! It’s the only range of 50 colours available in the Australian marketplace which means flexibility and creativity. The range allows for customers to invent what they would like to see. The product is designed to work together or separately, printed in all applications, mounted back to back up to 2100 GSM, embellished, cut, folded and even comes in an envelope any size you would like. It’s the ultimate bespoke product using the range of 50 colours. WG: Which embellishments or treatments do you think best suit Colorplan stock and why? TG: Colorplan is available in 25 different embossing patterns which means another unique look to your project. It takes foiling and obviously debosses very well. It’s also used extensively for letterpress printing. WG: What is so exciting about such a huge range of colours? Do you have a favourite? TB: Personalisation and customisation are two key elements that will provide a lasting impression with paper and print, in the digital age. Colorplan is part of this journey too. The ability to combine colours, print techniques and finishes together makes it possible to create a very unique piece. I have favourites – Mandarin and Factory Yellow are gorgeous citrus colours, I like Imperial Blue, Fuchsia Pink….OK, so I have 50 favourites! WG: Could you describe some of the creative things you have seen done with the paper lately? TB: Get a hold of the new BJ Ball Business Card – they haven’t failed me yet as a conversation starter! Amazing invitations using a blind deboss, no ink at all. Business cards, invitations and posters by AGDA. And, of course, the use of white ink on coloured stocks can change the look and feel of a printed piece simply and cost effectively. This entry was posted on Tuesday, October 14th, 2014 at 1:28 pm	and is filed under Business Cards, Debossing, Embossing, Foil Stamping, Invitations, Letterpress, Wedding Invitations. You can follow any responses to this entry through the RSS 2.0 feed. Both comments and pings are currently closed.